This tour was amazing . This tour was great! Got to see a lot of traditional Niagara Falls areas that you probably wouldn't have seen if you did it by yourself. Michael was a fantastic tour guide. Always giving information and asking passengers to ask questions. The stops for the tour were what we expected and quite enjoyed them. Having the guide speed us to the Niagara Falls boat was very good. Unfortunately there are a number of things that were not pleasing. I booked the tour 1 day before and paid in full. That night while I was asleep I got a phone call but didnt recognize the number so ignored it. Then I got a text msg. Ok better see what this is about. I got up and was not happy to read the msg. It was from King Tours. It was, to me, rude. It said unless I confirm our attendance no bus pickup, no refund. Very blunt. There are countless ways to ask for confirmation. And certainly not when I was asleep. We could have easily been waiting in the lobby of our hotel and never attended the tour. And lost our money. The tour information sent to me said I would receive an email confirmation about time of pickup. When I travel out of town I almost never take my cell phone since I dont want to pay roaming charges and find I dont use it anyway. We were picked up the next morning and taken to the King Tours office. We didnt know that would be the case. I thought we would be picked up in the bus we would be traveling in. We had no idea who the local operator was since this was booked through Viator. There was one person in the office and the driver who picked us up in the smaller van. The driver said the large tour bus would load at 9am. The sign on a counter said 9:30. Surely with a tight schedule there can be better communication between 2 people. Several people asked to use the washroom. As I walked to the washroom it was easy to see there was little concern about having a clean and orderly office. Floor had litter, shelves not sorted, etc. In the washroom there were no paper towels. Only a roll of toilet paper to dry your hands. And then we were told there is no washroom on the bus. We left and drove for a time on the highway and then pulled into a parking lot off the highway. Apparently we were waiting for other customers. But they were taken to the downtown office instead of the pickup point we were waiting at. Later we pulled into an outlet mall. Bathroom break only. Not having a washroom on the bus means limiting our time at the different stops even more. The bus was old. No seat belts. The driver spoke on the PA system using a hand held microphone. So often only had one hand on the wheel. I dont believe that is a safe practice at all. I do not fault the driver for this unless the other microphone I saw on a stand was not working. The driver would say things like look to your left and you will see. Well I could look left but the window was either very dirty or had a different problem. Yes it did rain a bit that day so all windows had condensation. But after we drove a long time in sunny weather other windows did clear but a number did not. And the grime was not what I would normally see from a window that was wet. It looked like it had a coating of white mud or something had leaked into the panes of glass. I noticed the driver sometimes had trouble opening the door. I really started to wonder about the safety of the bus. I dont have direct evidence but based the feeling on the various things I did see. I saw so many other competitor companies during the tour and thought we should have booked with them. At least the buses looked better maintained and modern. The sights you see and places you go take care of themselves. But I will not book with King Tours again and would tell people not to as well. Viator needs to do more work also. The tour itself was great. Problem was the transportation. Advertising said would be picked up and dropped off at your hotel. Received confirmation with time to that effect. Received an email the day before trip advising us we would have to find transportation to another pick up point but would be compensated. Pick up point was almost 3 KM away from our hotel resulting in us having to get a taxi to get there. Fortunately we had access to our email while on vacation, otherwise we would not have known about change in transportation plans and would have been charged as a no show for the trip. On returning same thing, dropped off at the location picked up instead of hotel. Had to start walking back to the hotel with all our purchases on the trip until we could flag down a taxi to complete the trip. Was never compensated for the extra expense of the taxi ride both to the pickup point and from the drop off point. When talked to the hotel staff about what happened they said they didn't understand the problem because tours pick up and drop off at the hotel all the time. So don't know if it is false advertising on the part of the tour company or the driver just didn't want to drive around downtown Ontario picking up and dropping off passengers. If you book, make sure you have email access on your trip and plan on either walking or spending and extra 20 for taxi fares not including tips. Excellent tour with plenty of time for looking around. We arrived at our pick up point early and the tour bus arrived just minutes later. Our tour guide was Louie, although my girls called him Fred most of the day, which he found quite amusing! We had a good group of people on our bus too, which makes the trip even more enjoyable. The first stop was a Pillitteri Estates Winery. Short and sweet stop here to listen to a short talk about how the wine is made and the history behind it. Also a shop for you to purchase Maple Syrup, a variety of jams etc as well as wine and Ice Wine. Also included in the tour was Souvenir City, with lots of lovely goods to buy and an opportunity to watch some glass blowing. We visited Niagara-on-the-lake. A very pretty town which I had only driven through on previous tours. This tour allowed us to stop and visit the shops. The fudge shop is a must!! 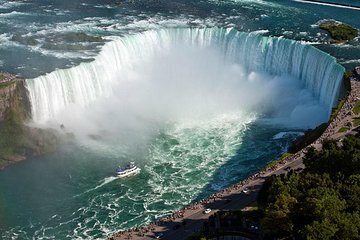 We were very fortunate when we reached the Falls that it was the last day of the Hornblower Boat Trips. You get to wear a very fetching poncho which keeps your upper body dryish! You get very close to the Falls and very wet!! A fantastic day all round. Louie was brilliant and we cant thank him enough for looking after us, even after the tour was over. Highly recommended. A good well organised tour with excellent guide. Very much enjoyed this trip! I would go again. Scott was very good. Great guide. The wine tour was a little disappointing since they now charge for wine tasting for ice wine which was free in last tour. The tour guide was very informative and very nice. I would highly recommend.